Harry S. Truman was a reluctant Vice President for less than three months when Franklin Roosevelt died. He was President for less than four months when he had to make the decision to bomb Hiroshima and Nagasaki, thereby ending the war in the Pacific. He was a straightforward, no-nonsense man, given to speaking his mind, yet politically astute. He knew when to keep his confidence and when to share information. Douglas MacArthur was a rumpled, imperious five-star general who believed he knew more about warfare than anyone else. Beloved by the Japanese, he understood the concept of “face” and implemented actions that enabled them to maintain their dignity in defeat. At the same time, he had been so sure of himself that he, while engaged in fighting a brutal war and in direct contravention of the rules of civilian-military hierarchy, began aborted runs for the presidency in both 1944 and 1948. In the latter, he actually ran against Truman, his commander-in-chief! In The General vs. 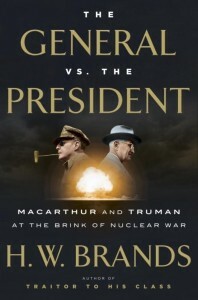 The President, H. W. Brands, professor of history at the University of Texas, sets the stage for the most incredible showdown between a president and a revered army general. This is a comprehensive history that concentrates on a brief period in our past, providing the necessary facts to help the reader clearly understand each man and his relationship to world affairs. The facts, and they are clearly well researched, are bolstered by what amounts to a psychological profile within the narrative for each man. MacArthur had an “elevated sense of self.” General Omar Bradley, Chairman of the Joint Chiefs of Staff and a long-time acquaintance, called him a “megalomaniac.” Regardless of his myriad skills as a military leader and subsequent victories, his impetuousness led him to “insolent, even insubordinate” actions toward Truman and the chain of command. For example, while in Korea and unable to come home, he sent a written speech to be delivered at a convention of the Veterans of Foreign Wars that contravened the diplomatic process Truman was pursuing in regard to Formosa versus “Red” China. He sent the speech without vetting it through the command structure, as was his standard operating procedure. Truman traveled to Wake Island in mid-October 1950 to meet MacArthur for the first time. The general kept the president waiting then left before lunch after a brief meeting. It was another rude action, but he had assured Truman that American soldiers in the United Nations force would be home by Christmas. It was not to be. He ordered an invasion of North Korea on October 24 which was swiftly followed by Chinese intervention. Just a month later MacArthur ordered a full-scale invasion with disastrous results. The Chinese, with an army of 200,000-plus, had effectively been in hiding and pummeled the UN forces. It was a disaster. It was clear that MacArthur had to be relieved of command. He had lied to the President, downplaying the size of the Chinese forces, the final straw in a laundry list of omissions and slights directed at those to whom he was responsible. 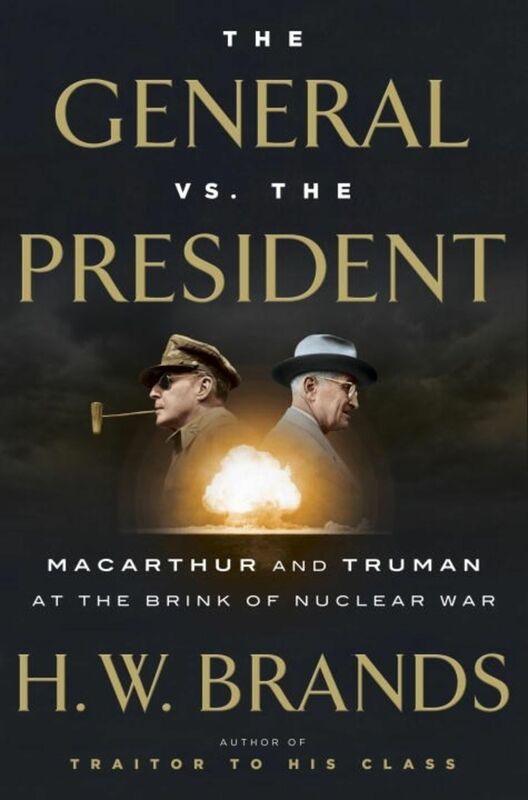 Brands succinctly sets the stage for Truman’s actions and the drama surrounding the ensuing controversy, a controversy that continues to this day as there are still people who will argue that MacArthur should not have been relieved of command. Nevertheless, Brands makes a compelling case that Truman had no other choice. This is history brought out of dusty archives, made human and eminently readable.